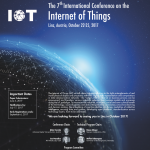 The 7th International Conference on the Internet of Things (IoT 2017) took place October 22–25, 2017 in Linz, Austria. The rapid advancement and ubiquitous penetration of mobile network, web based information creation and sharing, and software defined networking technology have been enabling sensing, predicting and controlling of physical world with information technology. Every business process can be empowered, and therefore, various industries redesign their business models and processes along Internet of Things (IoT) paradigm. To maximize the social and economic benefit of the technology, issues of interoperability, mashing up data, developing open platforms and standardization across technology layers have to be addressed. Pervasive connectivity, smart devices and demand for data testify to an IoT that will continue to grow by leaps and bounds. Computing power is dropping in price while new sensors are being developed and incorporated into everyday objects, and as people buy into IoT technology, economies of scale lend themselves to the creation of ever more data-centric businesses. Instrumenting and connecting devices has massive potential to deliver value, but there is need for a coordinated effort when rolling out the next generation of self-reporting paradigms. With the strong supports from industry and academia the international conference on Internet of Things has become the premier gathering place for visionary, academic researchers and practitioners around IoT. The 7th International Conference on the Internet of Things (IoT 2017), building on the success of its predecessors since 2008, is the premier forum for such efforts, to share, discuss and witness cutting edge research in all areas of development for the Internet of Things. 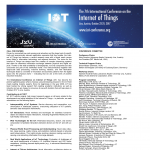 The Internet of Things Conference is seeking original, high impact research papers on all topics related to the development of the Internet of Things. Papers will be reviewed and selected based on technical novelty, integrity of the analysis and social impacts and practical relevance. If you are interested in sponsoring this event, please contact our treasurer, Gabriele Anderst-Kotsis. © 2019 IoT2017. All rights reserved. This website is hosted by the Università della Svizzera italiana (USI).